Many women in developing counties make excellent entrepreneurs. They reinvest 90% of income in their families and communities, compared with men who reinvest only 30% to 40% (World Bank). Women are more likely to use profits to help the poor and are more likely to hire other women. Significantly, Grameen Bank reports that women are far more likely to repay their loans than men. The owner of a micro-enterprise, a small business in a developing country, is an entrepreneur with limited resources who builds a business to support a family. Dorcas A___ is a school teacher in West Africa who also leads a group of women who set up a cassava processing business with the help of a local group offering business skills training. To supplement her meagre teacher’s income, she started farming five years ago but did not have the physical strength to wield a cutlas and hoe all day. “Poverty was frustrating. I avoided community events because my clothes were so old. “With group business skills training, we learned to see where we were losing or making money, to hang onto capital and pay ourselves each day. We also learned group dynamics, how to cope with each other, divide labour and avoid laziness and conflict,” says Dorcas. 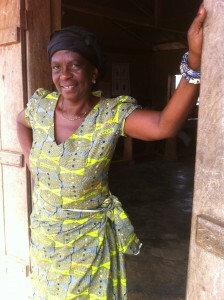 “After the business training, I began to provide for the basic needs of my family household. My husband is too old to work. With the money I am earning, I’m educating my four children. My youngest boy just started second year university.She leased a plot of land from her husband and is building her own cement house. “I stopped existing and started living,” she says smoothing her colourful dress fabric printed with the words High Life, a popular music style featuring jazz horns and several guitars that originated in Ghana. “Earning money, I can appear anywhere. I fit in with society.” High Life indeed. GHANA 2011: Five years ago, Happy Boateng was selling fish in the markets and barely making ends meet. Then she heard about business skills training offered by Pro-Link Ghana, a women’s empowerment organization. “Many people in our community took the training,” said Boateng who is now part of 50-person agricultural cooperative in Ghana’s Volta Region. 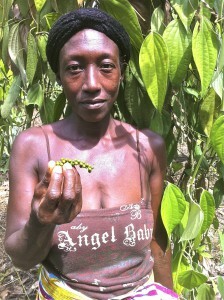 “We started cultivating black pepper bushes and now, thanks to my bank account, I have money to put into children’s education. In addition to black pepper, the group also grows cocoa, coffee and palm oil trees, raises raising poultry and runs a fish farm. GHANA: Justine Tengey (at left) says business training taught her to share profits and re-invest in her business. 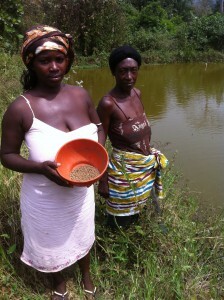 “Pro-Link business training helped me understand my profit and loss and see how well I am doing,” she said, tossing food pellets to fish raised in the communal pond, along with one of her 50 cooperative business partners, Happy Boateng. Earning a higher income, however, is more than making ends meet. Financial independence for women is critical to building equality—from increasing leadership skills to reducing violence. 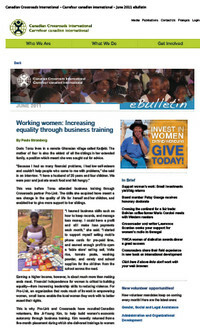 For Pro-Link, an organization that roots much of its work in empowering women, small loans and training enable local women they work with to better assert their rights. Earning a higher income is more than making ends meet. Financial independence for women is critical to building equality—from increasing leadership skills to reducing family violence. For Pro-Link Ghana, an organization that roots much of its work in empowering women, small loans enable the local women they work with to better assert their rights. Micro-enterprise development is an effective tool in addressing global hunger and empowering women.